The movie Cake is nothing if not bold in its intentions concerning what it set out to do. 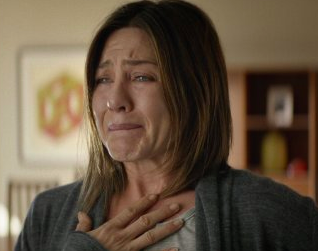 It gives us a look into the moody and depressing life of "Claire Bennett" (Jennifer Aniston). Claire has seen better days. After a terrible accident took the life of a family member and left her to survive in extreme pain, she spends her days self-medicating and attending a support group for chronic pain sufferers. The movie begins with Claire attending this group and getting tossed out as a result of her sharing her overly kurt feelings about another member who took her own life. Now on her own in the everyday struggle with herself, she enjoys Percocet, excessive amounts of wine, and under-appreciating her loyal housekeeper "Silvana" (Adriana "Drag Me to Hell" Barraza). On top of all her other problems, Claire needs to work on her personality. An infatuation develops with Claire on the girl who took her life, "Nina" (Anna Kendrick), and finally, with her husband "Roy" (Sam Worthington). It's a gloomy struggle, all in all, and the unhappiness is no small feature of the film for anyone. Cake doesn't have all that much going for it, but it does have two things: Aniston's performance power and Barraza's rightness for her role. The human relationships aren't executed quite as they should have been, and the film's predictable nature can become drudging at places. We know what's going to happen most of the time, but we are also subjected to a lack of any real peaks and valleys in terms of the dramedy that is brought before us. This is to say that nothing is seldom if ever funny enough to generate a big laugh or raw enough to bring us to tears--although, in a few places, it threatens to be. The conclusion of the matter is that Cake is a slow-going and only mildly rewarding experience. I was, however, no worse off for seeing it than when I went in. It brought back my own difficult days of fighting the pain of a degenerative foot that still presents challenges for me to this very day.